PHOTOS: A Closer Look at the Slippery Electric Renault Zoe Z.E. Renault Showcases All-Electric Zoe Z.E. Concept Car at the 2012 Detroit Auto Show – Exclusive Photos! Renault just showcased their Zoe Z.E. 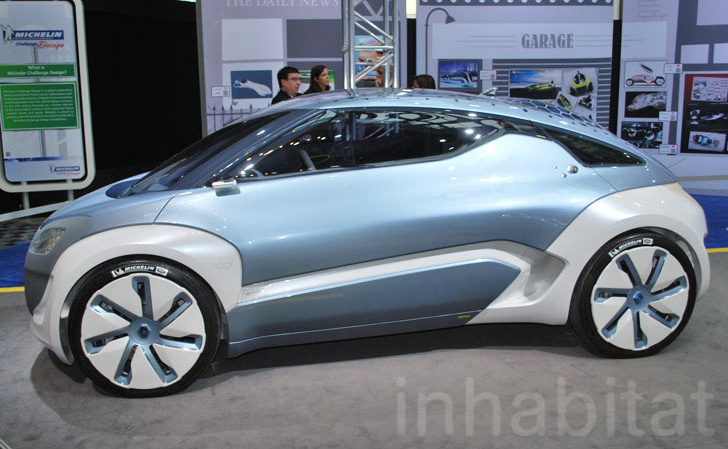 electric concept car at the 2012 Detroit Auto Show, and we got a chance to take a closer look at this Michelin Challenge finalist! With its fluid roof line and tiny wheel base the car is not conventional by any means, but it still has a pretty ample interior designed to seat four passengers comfortably. A gull-wing four door system offers visual flair and large entrances to jump into, but our favorite features are the vehicle's all-electric drivetrain and swappable battery. The Zoe Z.E. made its initial debut in 2009 but it still has a fresh design sensibility, as we saw at the 2012 North American International Auto Show in Detroit — it’s futuristic enough to turn heads but has a lot of practical features. The car’s swooping lines give it a radical aesthetic – from the windshield to the rear a gentle arch define the vehicle’s profile. A far-out honeycomb pattern is imprinted on the roof, which partially unfolds to offer access to the vehicle. The tiny car is only 4.1 meters long but it still has four doors thanks to a double gull-wing design. The front doors pivots up and forward (a trick BMW’s new i-8 seems to have channeled). A hatch-like door swings up to offer access to the rear seat, opening the entire side of the car. The front seats are described as asymmetric pebbles (if that is of any comfort) and are braced to the roof for rigidity. The Zoe Z.E. is powered by a 70 Kw, 95 horsepower electric motor fueled by a set of lithium-ion batteries and can produce 166 ft/lbs of tourque. What this means for real world performance is still not exactly clear, but Renault promises a 100 mile range per charge. A “Quickdrop” battery system makes it easy to keep the vehicle powered – simply swap the battery out like you would with a rechargeable drill. 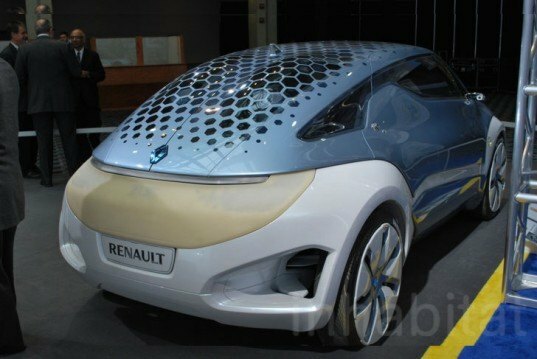 Renault has hinted at making the Zoe Z.E. into a full production car for a couple of years now. Renault Showcases All-Electric Zoe Z.E. Concept Car at the 2012 Detroit Auto Show - Exclusive Photos! The car made its initial debut in 2009 but it still has a fresh design sensibility -- it's futuristic enough to turn heads but has a lot of practical features. The car's swooping lines give it a radical aesthetic - from the windshield to the rear a gentle arch define the vehicle's profile. A far-out honeycomb pattern is imprinted on the roof, which partially unfolds to offer access to the vehicle. The tiny car is only 4.1 meters long but it still has four doors thanks to a double gull-wing design. The front doors pivots up and forward (a trick BMW’s new i-8 seems to have channeled). A hatch-like door swings up to offer access to the rear seat, opening the entire side of the car. The front seats are described as asymmetric pebbles (if that is of any comfort) and are braced to the roof for rigidity. A “Quickdrop” battery system makes it easy to keep the vehicle powered - simply swap the battery out like you would with a rechargeable drill. Renault has hinted at making the Zoe Z.E. into a full production car for a couple years now.